The deadline for finishing the book is fast approaching, and while we’re busy testing the recipes here, I need some help. Maybe you also need an excuse to make a sweet treat!!! Many of you have made some of these recipes, and I appreciate your feedback. However, I haven’t had much feedback on otherÂ recipes. I appreciate your help and would also appreciate if you could help me get the word out! I’d make em all if I had time. I’ll try for sure…..
Brownbread icecream, sunday. My family will be my guineapigs! I’ll give the sherry trifle a try. Might as well practice for Christmas! My son and I will try the gourmet Chocolate Crust a try and the Extreme Cocoa, there is no measurement next to the milk, is that ml? I will need to convert here in the states, also is the vanilla essence the same as vanilla extract?? thanks. Couldn’t refuse a black and white cocktail. Bottoms up. I think we’ll try the Strawberry and Sage one too given that we have a huge sage bush out the front and strawberries were one of the few things to grow for me this year. I made the Kahlua brownies and the chocolate and coffee fudge and am now completely pumped up on sugar! Wow, you can count on me for sure! I’ll take any opportunity to make ice cream. I’ll probably give the gelato alla crema a shot, and maybe (mmmm….) the chocolate coffee bean one too. Ooh! I never refuse the chance to be OCD in the kitchen! I’m on it!! 😀 With such tasty results, as well! Ooh! I never refuse the chance to be OCD in the kitchen! Iâ€™m on it!! With such tasty results, as well! I LOVE that the recipes are Metric!! My favorite!! I will try: Cinnamon, Cardamom Honey, and Extreme Cocoa. We don’t have to post our before and after weight, do we? 😀 I know I will enjoy this! 😀 Thanks for the opportunity! I will try Cardamom and Honey but will not use refined sugar. It is a poison. Strong words I know but eating refined sugar robs the body of vital vitamins and minerals in order to assimilate it. These vitamins and minerals are intact in unrefined traditional sweeteners like Rapadura (dehydrated sugar cane juice), maple syrup, maple sugar, palm sugar and honey. You can have your ice cream and eat it. No guilt. Using rapadura, whole raw egg yolks and cream (even better if unpasteurised), this food is actually a nutrient dense health food. True! The taste of unrefined sugars is by far superior and no carpet tongue, sore tummy or sugar high and crash. Oh, sure, I miss a few days and I miss this! I guess I’ll have to wait until the next go-round, though I think the cinnamon would be wonderful with my Thanksgiving pie! Oh, huh! I’m happy to help out, but it’ll be a bit strange making a recipe from another blog without changing it at all. Torturers! This is worse then water boarding! Make ice cream AND eat it!? The nerve. And I’ve always thought of my Irish ancestors as warm hearted souls. Ok, alright, I’ll make the cinnamon ice cream and report back. I will be happy to make the Gelato alla Crema and the Coconut and Rum Ice Cream. These are two of my favorites. I just bought a litre of beautiful organic cream the other day and have been trying to figure out how to use it all. This is perfect! At any rate, great recipe! One weekend of testing complete. You can check out our results at the link above. Thanks for sparking a lot of fun!!! Really great fun. Are you including a conversion chart in the book?? It would be wonderful if you did, the results would be so exact and uniform that way. Delicious recipes, we will be trying more. Thanks for the fun. Send you a e-mail about the brown-bread ice-cream. We loved it and will try it again. as I am in New Zealand, i will try the manuka honey and orange blossom ice cream. I will let you know how well liked it was! Thanks, all! Sharp eyes, Suzanne! I knew I’d get caught out with the apple blossoms! I loved this challenge. I tried the cookies and the strawberry sage. I can’t wait for the book. Check out my post at http://supertaster.blogspot.com/ I should have some more photos later. 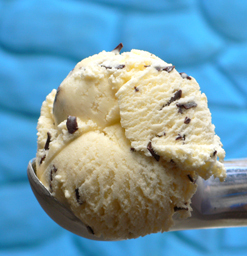 Am new to the blogosphere but think I’ll try the honey cardamom ice cream (YUM) will post as soon as possible. Going to try the honey cardamom ice cream. I’ll blog about it as soon as I’m done! Ah, if only I had an ice cream maker! I once made ice cream in a large plastic bag filled with ice, and it actually turned out! I think I’ll try one of your sauces or your hot chocolate–they all look divine! Here’s my attempt – this was DIVINE and one of the nicest ice-cream’s I have ever tasted. Hi Kieran, your Kahlua Espresso Ice Cream was just fantastic. Here is my review: http://www.chocolategourmand.com/blog/?p=47. i hope it’s not too late. it’s still the 25th here in Oregon, USA! I would like to make the raspberry lime sorbet. Noticed the date is it too late? It’s too late for the book, but it’s never too late to make ice cream! By all means make it, and let me know how it turns out!